IISD Experimental Lakes Area’s success depends on its facility, resources and equipment. These are essential to carry out our vital research and contribute to conservation science. Your corporate support will ensure that we have essential equipment and supplies, allowing us to focus our efforts and resources on environmental science. Please consider providing support through monetary or in-kind donations, sponsorship of programs, required products, equipment or services. In return, we will provide a platform to recognize and promote your business through a number of channels that can be tailored to your needs. Your generosity will help find real-world solutions to some of the most pressing issues facing our freshwater sources. Interested in developing a corporate partnership? Our researchers are riding in style this year thanks to our new corporate partner Polaris Industries Limited! 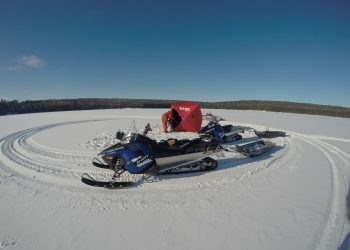 IISD-ELA signed a partnership agreement with Polaris to provide us with new off-road vehicles and snowmobiles. 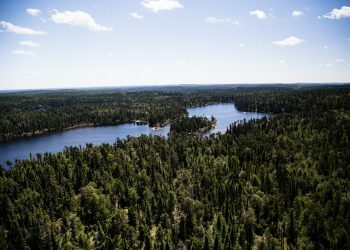 Our thanks to Bart Stevenson, president and owner of the Kenora-based Forest Helicopters who generously donated free helicopter rides so that our special guests could get a bird’s eye view of the IISD Experimental Lakes Area site.